I am delighted to be invited to contribute to this project. I was delighted to be invited to contribute to the Fifty Bees exhibition. Lydia Needle has created fifty beautiful lifelike species of bees in felt, displayed in delightful compact boxes. These bees are the basis of this year’s FIFTYBEES exhibition. Shown alongside them at RJ Museum Swindon will be the 50 other companion artworks created by 50 other artists (and I am one of them). The preview evening is 1st June from 7-9 and then the exhibition is open most days until 24th June. My bee was Geoffroy's Blood Bee. 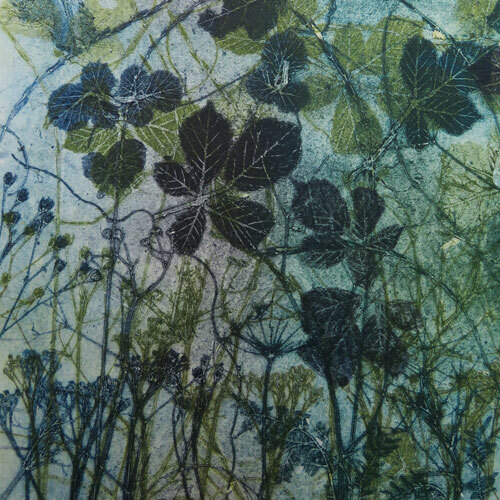 My bee likes open habitats and among the various plants it visits are umbellifers which I love to use in my printmaking. I therefore wanted to create an image that incorporated the umbellifers and I was drawn to the tangle of shapes that I found at the edge of fields and beside hedgerows on my walks.